LA 411 is the nation’s most qualified production directory. We will verify that you or your company has relevant experience in film, television, commercial or alternative media productions. To be listed, you must submit three references that confirm you perform the duties of the category you are applying for. Choose your level of exposure. Contact us for a customized marketing package. Get Premium exposure with a Premium Listing. 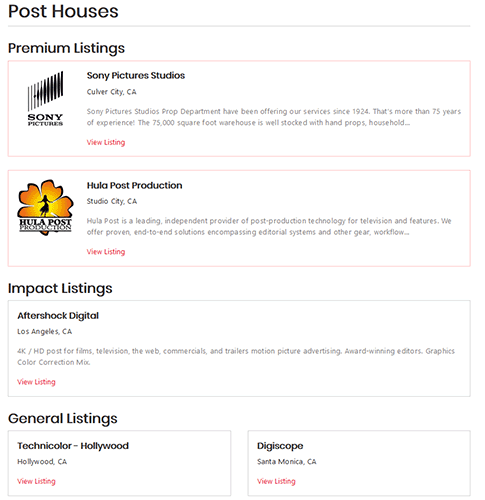 Premium Listings appear at the top of the search results with your logo. Banner Advertising packages are available. Reach your target audience exactly where they are searching for companies and services like yours. Contact us for custom advertising packages.